Read more about the Santa Clarita Valley areas served. We offer our clients and families a comfortable and private place to handle the paperwork and always have available, hot coffee, tea, water, snacks and refreshments, while they wait for their loved ones release. This, versus waiting long, arduous hours in a sheriff’s station lobby. Those who are arrested in any of the above areas will likely be taken to the Santa Clarita Sheriff Station where they will go through the booking and processing procedure. This process is one that you’re likely familiar with, as it is often depicted on television and in movies. It includes taking an inmate’s photograph, recording their fingerprints and conducting a national background check. Only after these things have been completed will an inmate be cleared for bail and eligible for release. Read more about Santa Clarita Bail Bonds. If you need help locating your friend or loved one, our offices are open 24-hours a day, 7-days a week. We can be reached at 661-299-BAIL (2245) or toll-free at 877-422-4591. 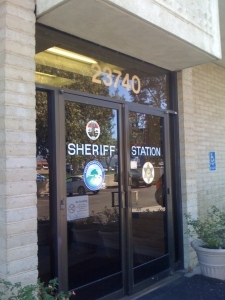 Visiting hours at the SCV Sheriff Station are from 10 a.m. to 2 p.m. daily. Visitation is limited to 1 adult and 2 children per day. If an inmate at the SCV Sheriff Station is being charged with a misdemeanor, he or she will be arraigned at the Santa Clarita Courthouse, located next door to the sheriff station. Felony charges, however, are arraigned at the San Fernando Valley Courthouse. Hours 8:30 a.m. to 4:30 p.m. Monday through Friday, except holidays. Hours are 8:30 a.m. to 4:30 p.m. Monday through Friday, except holidays. The on-site jail at the Santa Clarita Sheriff Station is comprised of 11 cells and has room for about 40 inmates. It is not designed for the long-term housing of inmates, and, as a result, if someone is not bailed out after 72 hours, or if the jail becomes overcrowded, he or she is likely to be transferred to one of the larger facilities downtown. Men are taken to Twin Towers Correctional Facility while women are transferred to the Lynwood Jail. Visiting hours at Twin Towers are Saturday and Sunday from 7 a.m. to 3 p.m. and Monday and Tuesday 9:30 a.m. to 12:45 p.m. and 2:30 p.m. to 6 p.m.
Twin Towers jail is a facility for male inmates, and is a much, much larger and busier jail than the one located at the SCV Sheriff Station, and as such, the jail allows for the scheduling of visitations up to 7-days in advance. Lynwood jail for women, otherwise called, C.R.D.F is a much larger county jail than the Santa Clarita jail. Visiting hours are Saturday and Sunday 7:30 a.m. to 12:30 p.m. and 2p.m. to 5:30 p.m. Monday through Friday visiting hours are from 915 a.m. to 1 p.m. and 2 p.m. to 4 p.m.
For more information in regards to visitations at the Lynwood Jail, take a look at their visiting info. When an inmate is transferred to one of the larger county facilities, he or she must be processed into the system at their new location. During this period, the inmate cannot be bailed out, even if a bail bond has been obtained. It is only after the inmate has been “processed in” to the larger facility, that he or she can then be “processed out.” As a result, inmates who are transferred are likely to spend an additional 24 hours or longer in custody as they go through the system. If the bail bond process is begun quickly, though, while the inmate is still located at the Santa Clarita Sheriff Station jail, then it is possible to avoid the transfer process altogether and bail him or her out very quickly from Santa Clarita. If you are unsure as to where your friend or loved one is located, the LASD Inmate Locator can be a useful tool. If you want fast access to Santa Clarita Inmate Information, give us a call locally at 661-299-BAIL (2245) or toll-free at 877-422-4591. A locally licensed, professional bail bondsman is available 24/7 to take your call.